On Tuesday, Dec 1, 1998, I got a very unusual phone call from a Jan Cornish. She said she was out surfing the web because her friend Spider John wanted to come to Beaufort, NC over the weekend and she was looking to find someone who could show him around. At that time, I didn't know who Spider John was. So I went surfing the web for more information on the man and read some very interesting facts. My wife, Lisa and I, were very excited about having the opportunity to meet this man so we got up with Jan again and set up some arrangements for John in order to introduce him to our area of the world. After a couple phone calls, it was all arranged that John would spend Thursday and Friday night, Dec 3-4 with us and head out Saturday morning for his scheduled concert in Chapel Hill, NC. Somehow, the plans changed on his way down to NC from the airport in Raleigh, NC. Now it was planned that he would drive straight through to Beaufort on Thursday night. See the sign? 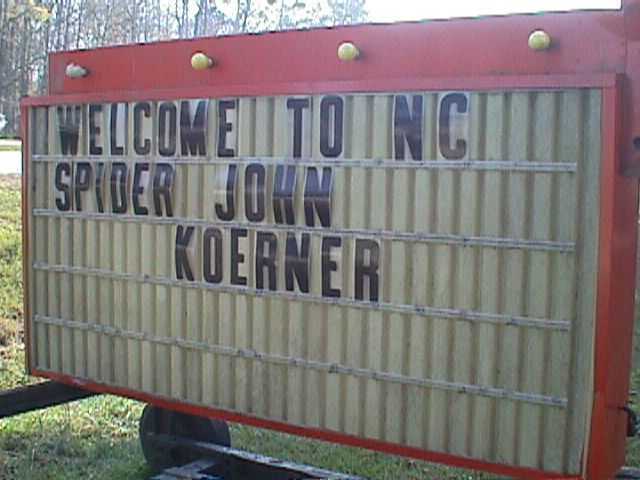 If your name was Spider John Koerner, do you think you might have noticed it? We were so disappointed when we heard John was going to drive straight through, we decided to at least welcome him to the state and let him know where we were so he could find us when he cam back the next day, so we put this sign out by the street and lit it up for him. He was expected to drive by around 8 pm Thursday night. Around 8:15 pm, someone drove in our driveway. Ernie and I just looked at each other and said "Could it be?" Was it possibly Spider John? So we put on our shoes and rushed out the back door, and there he was! It was really and truly the one and only SPIDER JOHN! On Friday afternoon, I finally got a chance to go out in FEVER! John and I rolled out the boat and trailer and headed out to Union Point. The weather was PERFECT! Just a bit of wind to get us out there on the water and relax. John needed it as much as I did and it was a wonderful afternoon. John even took the tiller and sailed the boat himself! Saturday morning came all too soon and it was time to say goodbye to John. He autographed two of his wonderful CD's for us and then even autographed two more for some very special friends of ours. And then he patiently stood around for us to take a couple pictures of him with us. I mean this man is a real trouper! So off he went after he loaded up his car and he headed in one direction toward Chapel Hill, NC and we took off in another towards Myrtle Beach, SC for our Saturday afternoon concert. To say the least, it was a very busy weekend! But we enjoyed EVERY minute of it. Thanks Spider John! You left us with wonderful memories and we hope you come visit again! *You are now leaving this site. Use your browser "Back" button to return here.